About a month ago, I bought a Pebble smartwatch through an Amazon deal for £75 (down from £100). I did want a Microsoft Band. But despite my wife working for Microsoft and visiting the Redmond HQ last month, one couldn’t be found. So a Pebble it was. After a month wearing it I don’t regret buying one. It has a few annoyances, but the sheer utility of it means it’s always on my wrist. Ben Evans wrote recently that “Watches… are largely messaging and notifications devices”. It’s hard to disagree there. 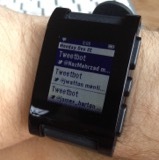 While that sounds limited, notifications on my Pebble are incredible useful. There’s plenty of times it’s just not convenient, practical or polite to check your phone. 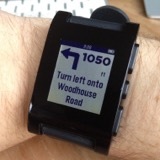 Discreet alerts on the Pebble make it easy to check what’s going on: text messages, tweets or football scores. My watch connects to my iPhone 4S. The Pebble picks up any notification I’ve set up on the phone. I’ve spent a little time customising them to give me exactly what I want. For example, I want to know if someone mentions me in a tweets, but I don’t if they retweet or favourite one of my tweets. It’s not perfect. 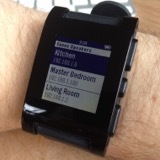 Occassionally the Pebble will stop getting the notifications. I’m unsure whether that’s due to my elderly iPhone running the buggy iOS8, or something else. I’ve got a OnePlus One on order, so when that arrives I’ll see if the situation improves. The Pebble experience on Android is not the same as iOS; some say it’s better, or at least more varied. I’m now checking my phone far less than I used to. It’s always set to silent or vibrate. This brings benefits to battery and married life. Speaking of battery life, I find that I only have to charge the Pebble every 3-4 days. Some people get up to a week. It depends on how many notifications you get and how often you use apps. I’m confident going away for the weekend with a fully charged Pebble and leaving the charger at home. Pebble has a ton of apps you can download. Some operate with companion apps on the phone, others run completely on the watch. I’m a frequent Boris biker. PebbGPS helps a lot to get me around town without having to check my phone at traffic lights (yes, I stop at red traffic lights). You set the destination on the companion app and away you go. There’s a few different GPS apps to choose from. Pebbos is a simple Sonos client. You can select whichever Sonos unit you want play, pause, forward or adjust volume. Usually I find this much quicker than firing up the Sonos app on my phone. If you want get your first piece of wearble, I think the Pebble is a solid choice. It’s relatively cheap, has great battery life and a large selection of apps. I know there are more beautiful smartwatches, but they cost at least double and the battery life stinks. There’s still time to get one before Christmas! But what does it mean for marketers? Oh god, really? Ok then. For me, it comes down to notifications (as per Ben Evans). It’s hard getting people to download your app. Then it’s even harder getting them to use it. Useful, timely and controllable notifications are an essential part of any app. If the activation point for an app is its notifications (via a smartwatch), suddenly they’re critical. @beeston Do you think smartwatches will be a thing, eventually? @AndrewGirdwood Dunno. I can’t imagine them having popular appeal. Perhaps the Apple watch will change my view.